Blogger is known as one of the best free blogging platforms and that’s why hundreds, thousands of people start new blogs on this free platform knowing they won’t need to pay anything, especially students who have very less amount of budget. So, they simply purchase a domain and go with blogger (blogspot). Now, after starting a blog, most things are perfect as they have good dashboard to work with, simple navigation, but you may feel one major thing missing. That major thing is, Blogger platform templates are not SEO friendly and as you know SEO plays an important role in the success of your blog, So, you have to make your blogger template SEO friendly in order to improve your on-page SEO. But mostly Newbies start on the Blogger platform, so it’s gonna be very difficult for them to make blogger template SEO friendly as they have very little or no knowledge of coding. But you don’t need to worry because here I am writing a simple guide which will help you make your blogger template Search Engine Friendly. So, let’s begin the guide without wasting too much time. You must have noticed, when you use blogger templates, Title of the blog appears before the post title. If I take an example of this blog and this post, I have written post title “5 Compulsory Steps to Make your Blogger Templates SEO Friendly”. So, I need Users to read this title when they search on a similar topic, but if you are using a normal blogger template, then it will show the title of the blog first, rather than post title. For example, “OnlyLoudest – 5 Compulsory Steps to Make your Blogger Templates SEO Friendly” which is not a right method. It will reduce your blog’s CTR and will have many other negative benefits. So, what you need to do, Optimize Title tag which the below given method. Open Dashboard >> Template >> Edit HTML >> Find “<title><data:blog.pageTitle/></title>” using ctrl+f and replace it with the below given code. As you know H2 and h3 tags are used to create a clear view of the content so readers can read everything easily. They also have one more advantage, search Engine crawler used to pick up the keywords used in heading tags and rank that article based on that keyword, but search Engines always give more importance to H2 rather than H3. So, it is advised to use the H2 tag for post title in your blogger template and the way to use H2 tag is given below. And Replace it with the green color code given below. For improved crawling, you must enable Custom Header tags from Settings page>> Search Preferences and make settings as given in the screenshot below. 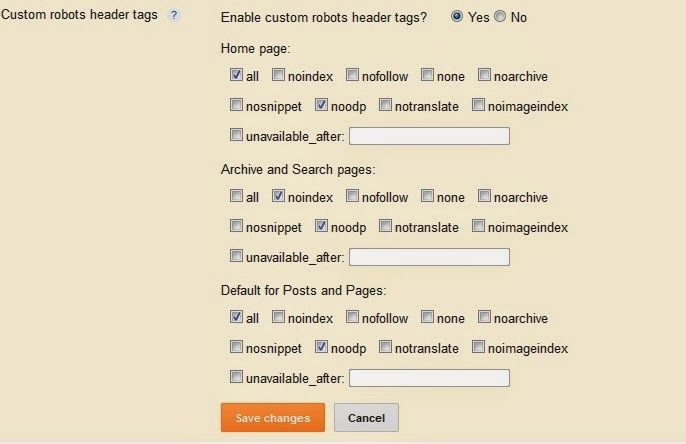 A custom Robot.txt file will help you better control your blog, in case you don’t want to index everything. It will avoid any duplicate content problems which may occur when crawler have access to every bit of your site. So, Enable Custom Robot.txt file and paste below given code in it.